Caerfai Bay Beach01437 720392work BeachCaerfai Bay near St Davids in Pembrokeshire has cliffs of purple sandstone and a sandy beach at low tide reached by steep steps. 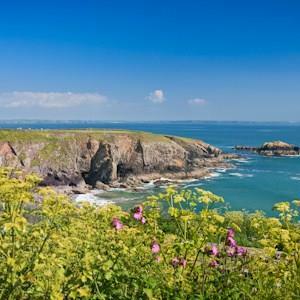 There is free parking above the beach with picnic benches and views of the islands of Skomer and Skokholm. Caerfai is the closest beach 1.5 miles (2.4 km) from the cathedral city of St David's and can be reached by the Pembrokeshire Coast Path. Nearby is the Chapel of St Non which is the most westerly in Wales. Caerfai Bay near St Davids in Pembrokeshire has cliffs of purple sandstone and a sandy beach at low tide reached by steep steps. There is free parking above the beach with picnic benches and views of the islands of Skomer and Skokholm. Seaside Award and Green Coast Award beach. Nearby St David's has restaurants, cafes, shops and a visitor centre. Dogs are allowed. Entering St David's from the east on the A487, turn left where signed to Caerfai.